Back to basics today. Some things in the closet are utility pieces. Go to bottoms or tops that are a great canvas. Today we are looking at some of my favorite navy ankle pants. Simple, classic, and a great base for a killer outfit. Classic. A great silhouette and waistline. A beautiful front seam pant that is going to lengthen your legs and give you a killer tush. Unusual for a slim cut pant, working pockets! Good work Loft. Don't hate me, I went a little rogue with this navy pant. It has simple dots on it and I'm not sorry. Sometimes you want to shop for statement pieces; other times it's staple piece shopping. 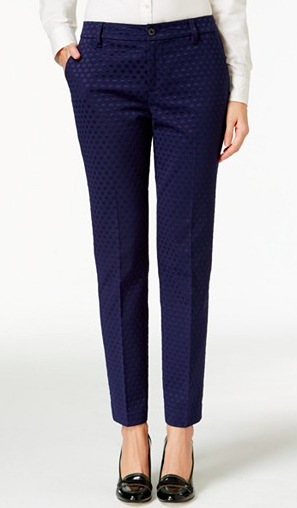 If you are looking for a do it all pant that isn't denim, navy is your go to.